Italian minors at Manhattan College can tap into the city's rich Italian heritage. Known as la bella lingua (the beautiful language), Italian is an enchanting language from a cherished culture. From the Roman Empire to the Renaissance, Italian culture has been a powerful force in global affairs throughout history. Although Italian is the official language in only five countries, it has a broad cultural reach throughout the world. From Renaissance art to classical music and opera, an understanding of Italian will broaden your horizons, especially in the liberal arts. And our small class sizes allow you to develop language competency as well as establish a close relationship with your professor. "I studied Italian in high school for three years and I had an amazing professor, who was from Calabria. She was the inspiration for my interest in Italian. In addition to teaching us the foundation of Italian grammar, she also shared with us the culture and that was really great. I found a lot of contemporary Italian music that I love listening to and it also helped me learn the language better. So I knew I wanted to continue it in college but I also knew I wanted to study biology, and Manhattan College had both programs. "I started taking Italian with Professor Wanger and it was great because the class was all in Italian. It really made me work on my comprehension skills and speaking skills. I also began working as an Italian lab assistant where I work with students in the introductory level Italian classes. I try to bring the enthusiasm I’ve seen in my Italian teachers to my students in the labs. It’s been a lot of fun and I really started to like the teaching aspect of it. 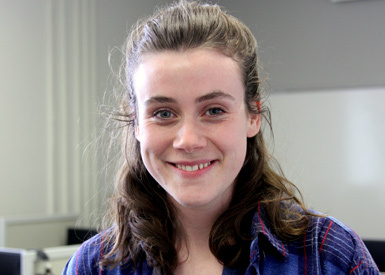 "I’m not 100% sure what my plans are after graduation but a big interest of mine is environmental sustainability and environmental science, specifically food sustainability and food quality. I think there are a lot of issues with what’s in our food that we don’t know about. Sustainable agriculture and how the food is grown is really interesting because it effects the ecosystem and the ecology of the surrounding agriculture. I think Italian really influence my interest in food because it was through Italian that I learned about Italian cooking and I began cooking in high school because of that class. I learned about all the pure food that comes from Italy and how eating is such a beautiful thing—it’s a way of learning about other cultures and coming together. "Professor Wanger has such a wealth of knowledge about Italian history and Italian literature. I’ve really enjoyed all the authors we’ve read, and discussion is a huge part of class so she’ll ask us questions that really get us to think and interpret what we read. While you may do this in an English class, there is an added component being in Italian where you have to translate it then can appreciate it, that added component just makes it so beautiful. I’ll go to Professor Wanger’s office sometimes and just pop in to say hello, she’ll invite you to sit down and there is the big bookshelf filled with French and Italian books, tapes and videos. She’ll offer you a candy and you’ll sit down and when you leave you have a smile on your face. It’s nice really nice especially as a science major to have that extra other experience in the liberal arts." There is a high demand for employees who speak in more than one language. Regardless of your intended career path, multilingual proficiency makes you a stronger job candidate. A Italian minor is an excellent complement to just about any career whether in the liberal arts and sciences or in business, engineering, education or the health professions. See the Spanish major or French major page for further information about careers specific to modern languages.